After searching some “ancient sources,” I’ll hazard an educated guess that this look up Front Street (First Avenue) was photographed in the late summer or fall of 1884. The number of well-leafed trees packed between buildings indicates this is not in winter. But why 1884? The unnamed photographer stood on the top floor of the nearly new Occidental Hotel, one of the then-prospering city’s showpieces, and looked north to another, the Frye Opera House at the northeast corner of Front and Marion. Here, the reader must concentrate. 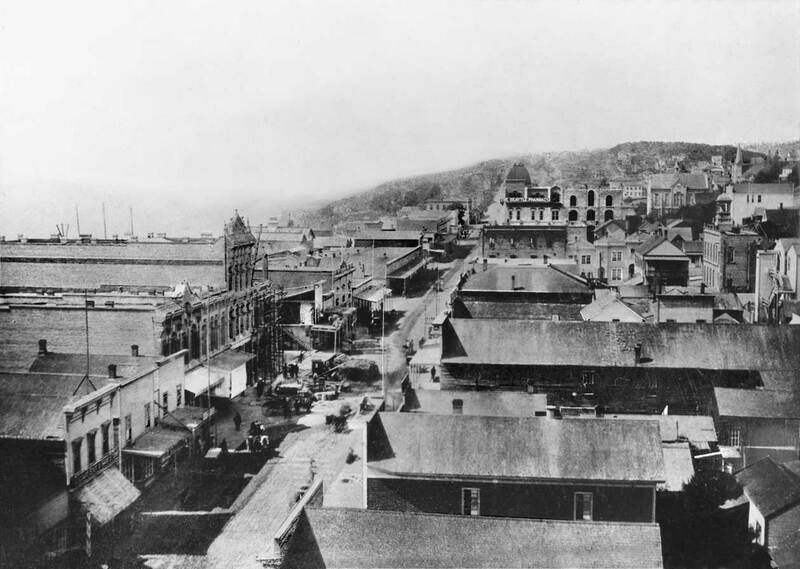 The mansard roof line of the opera house and its dominating tower, shaped like an inverted basket with the hazed mass of Denny Hill behind it, can be located above and to the right of the center of the photograph. The Frye opened in early December 1884, although the structure was not completed until 1885. Here, the rear half of the “largest theatre north of San Francisco” — that part to the right showing the seven large, vacant windows through three floors — is still far from complete. More evidence for 1884 appears with the construction scene on Front Street, left of center, for the ornate Safe Deposit Building at the foot of Cherry Street. In his 1901 “Chronological History of Seattle,” Thomas Prosch notes that the first pressed bricks used in Seattle (7,000 of them) were brought from San Francisco in May of 1884 and used for the Safe Deposit Building. By 1888 that entire west side of Front Street between Columbia Street and Yesler Way was filled with ornate brick buildings. It was Seattle’s elegant show strip. All of them, and practically everything else in this panorama, including the opera house, was kindling for the city’s Great Fire of 1889. Then: Looking north from Pioneer Place (square) into the uptown of what was easily the largest town in Washington Territory. This is judged by the 3218 votes cast in the November election of 1884, about one fourth of them by the newly but temporarily enfranchised women.Tacoma, in spite of being then into its second year as the terminus for the transcontinental Northern Pacific Railroad, cast 1663 votes, which took third place behind Walla Walla's 1950 registered votes. Now: For the contemporary repeat Jean Sherrard used his often-helpful extension pole to lift his camera high above the highest part of the parking garage that to many famously resembles a ship sinking between James Street, Yesler Way and Second Avenue. 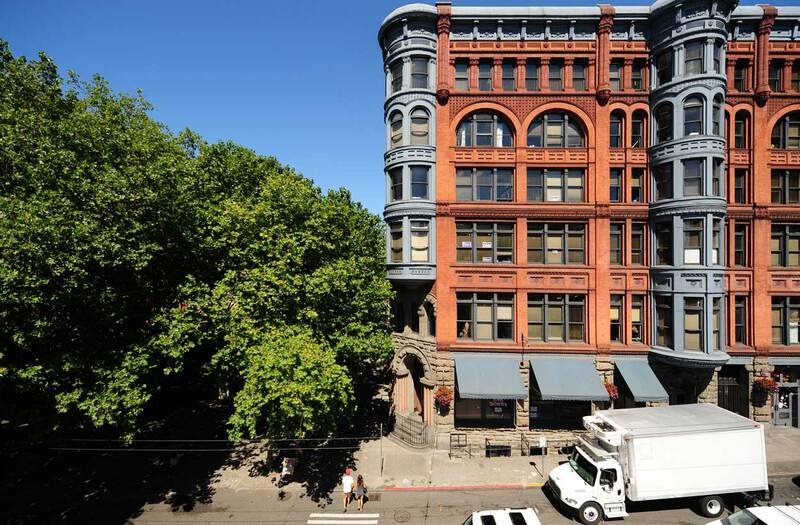 The trees of Pioneer Square hide First Avenue. On the right is the Pioneer Building, planned before the Great Fire of 1889 and built soon after it.